From a British major general and military historian, a thoughtful study of political leadership. Strawson, a WWII commander of Churchill’s old regiment, the 4th Hussars, draws occasionally on personal memories of the leader in sketching his portrait of Churchill’s rise to prinme minister after years of isolation, defeat, and political irrelevance. He draws, too, on his wartime hatred for the enemy in narrating Hitler’s rise from obscurity. The author surveys Churchill’s upbringing as the privileged son of a parliamentary leader, his indifferent academic career, and his experiences as an imperial cavalryman, journalist, cabinet member, and politician. Simultaneously, he delineates Hitler’s contrasting career as a frustrated artist, WWI infantryman, political demagogue, and dictator. Mostly, though, Strawson devotes himself to retelling the familiar story of WWII. As one expects from a British army officer who remembers the salvation of his country from the Nazi foe, objectivity is not a goal. 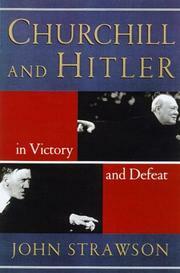 For the author, Churchill was “genial, warm-hearted, generous, emotional, witty, open, overflowing with life and appreciative of all its pleasures, chivalrous and honorable,” while Hitler was “secretive, cold-hearted, ignoble, vindictive, close, venomous, narrow, petty, and dishonorable.” The juxtaposition of the two men reveals that in breeding, background, character, and experience, they were opposites, as were their leadership styles and reactions: Hitler was exultant in victory and malignant in defeat, while Churchill was dauntless in defeat and magnanimous in victory. While adding little to our knowledge of either one, Strawson demonstrates how their powerful personalities shaped events and in large part determined the course of the European war. An absorbing dual biography that makes an original contribution to the seemingly endless body of WWII literature and Churchilliana.